A Taste of History with Joyce White: Cooking with Orange Flower Water: Orange Butter! Cooking with Orange Flower Water: Orange Butter! Orange Blossom Water was a very popular flavoring in the 18th and 19th centuries in American and English cookery. It is derived from the distillation of orange flowers from the Seville Orange tree or other varieties of orange trees. 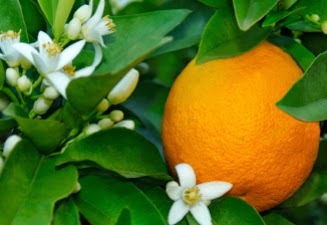 The use of orange blossom water in cookery comes to the west from North Africa, The Middle East, and the Mediterranean. The flavor of this distilled water is flowery but not too overpowering. Rose Flower Water was also very popular in American and European cookery, and also of Middle Eastern origins. From Court Cookery, or the Compleat English Cook by R. Smith (cook to King William and the Duke of Buckinghamshire), London, 1725. Take the yolks of five hard eggs; put to it a pound of butter, a little refin’d sugar, with spoonful of orange flower water, and work it through a sieve. Almond and Pistacia butter is made the same way, but let them be blanched and pounded. Place the cooked egg yolks, butter, sugar and orange flower water in a medium sized bowl and mix together thoroughly with a wooden spoon or an electric mixer. According to the original c.1725 recipe, this butter can be passed through a sieve to mix all of the ingredients, but it is not necessary with today's modern mixing equipment. Serve with cake, freshly-made bread, or on toast points.